Gathering friends around a table is the best way to say thank you! There is always a reason to celebrate, to say thank you, to enjoy your friend´s company. Pippa wanted to do all these things with some very close and special friends who supported her and his husband during the last months. I can´t be more pleased to cater for Pipa and Dave´s special occasion. I met them a couple of months ago while I was catering to another event at their Wine Club. they loved the menu I cooked for that occasion and thought it would be a good idea to do something similar with their friends. So we had a quick chat about how the private chef service works and a few days later she emailed me to have a menu and set a date. 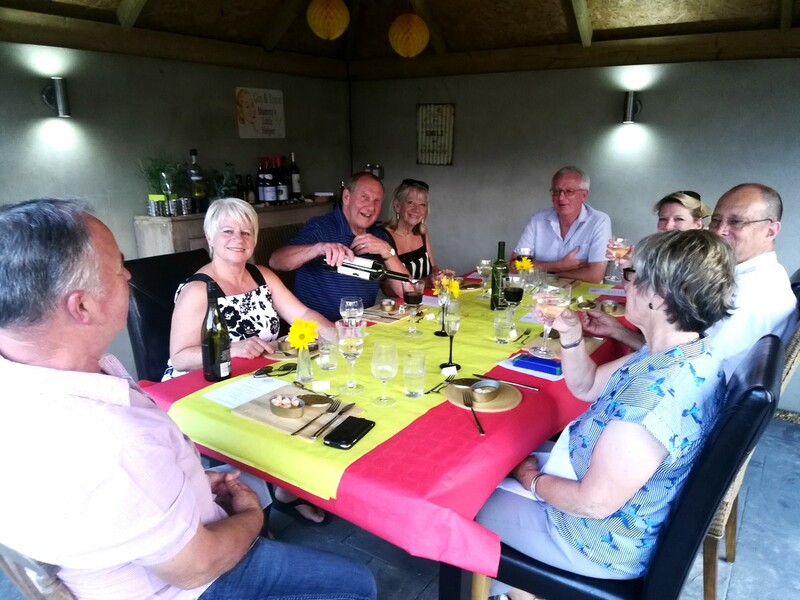 I offered a couple of tapas menus to do the night more different and special and even a bit more informal as they wanted to have a relaxed dinner with friends. We discuss the options, adapted what they wanted to their guests’ likes and we turned up with a lovely, summery menu! As I work for small groups I can be flexible to accommodate a menu for each event and each customer as each event and each customer are different, unique and have different needs. 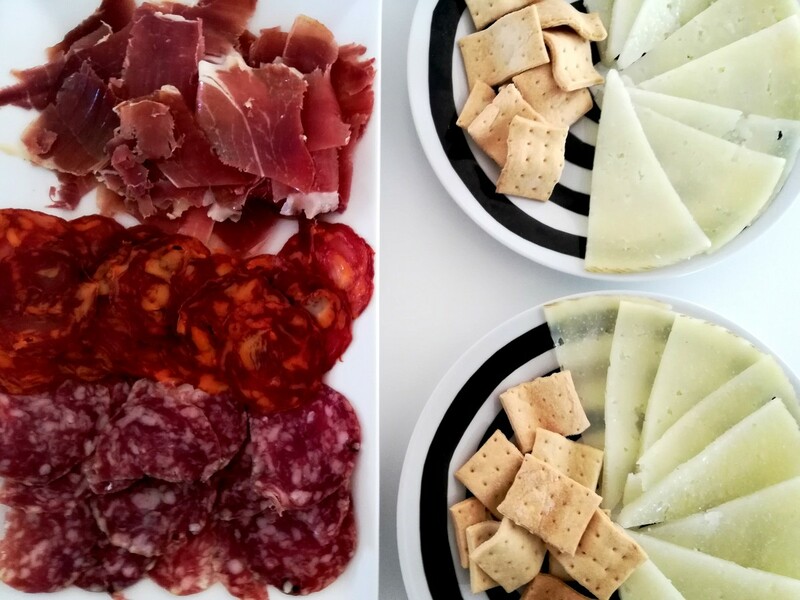 They had a cured meats and cheese board with serrano ham, chorizo and salchichón ibérico and Manchego cheese, with artisan sourdough bread and tomato. 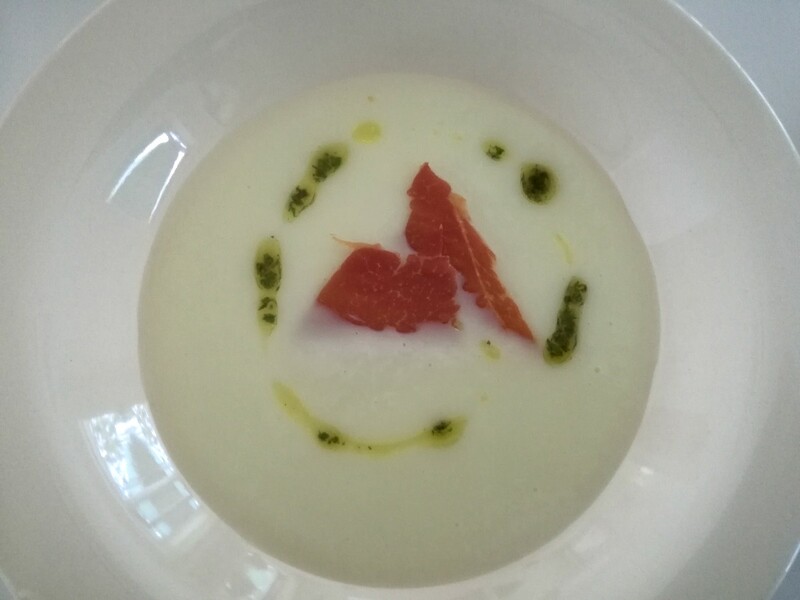 After that, a fresh melon soup with crispy ham and basil infused extra virgin olive oil. This dish surprised them as it is a cold soup, creamy and the combination of the sweetens from the melon and the saltiness from the ham is perfect! Then they had piquillo peppers willed with mushrooms in paprika sauce, prawns with garlic – some of them dipped the bread until the can was clean! I love that!-. (Yes, sorry, I serve the prawns in a cute sardine can! 🙂 And the savoury tapas finished with “pollo al chilindrón” ‘ chicken with a tomato and peppers sauce from Aragón. 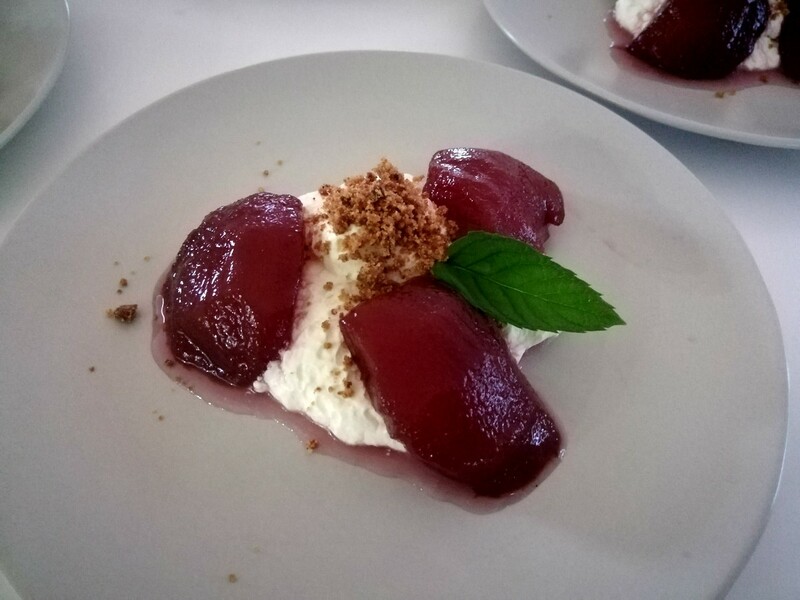 To finish, a sweet dessert from my region, poached peach in red wine with vanilla cream, sweet crumbs and caramel. It was a perfect end to a warm and lovely evening. Yes, the weather was wonderful and everybody felt like… in Spain! If you want to know more about my Private Chef Service, have a look here. I will be pleased to answer any questions you have and customize a menu for your occasion.